An artist of Tibetan ethnicity, Tenzin Norbu Gurung works in Dolpo, Nepal, where he hails from a lineage of painters dating back four hundred years. He was trained by his father in the art of thangka painting, an integral part of Tibetan spiritual life that traditionally was supported by monasteries and patrons. Today, however, adept teachers and economic opportunities have become difficult for artists in remote, culturally Tibetan communities of Nepal. An artist-in-residence at Cornell University in 2001; Norbu now trains apprentices in Dolpo, who then return to their own communities to practice traditional painting in the restoration and renovation of monasteries and other cultural treasures. 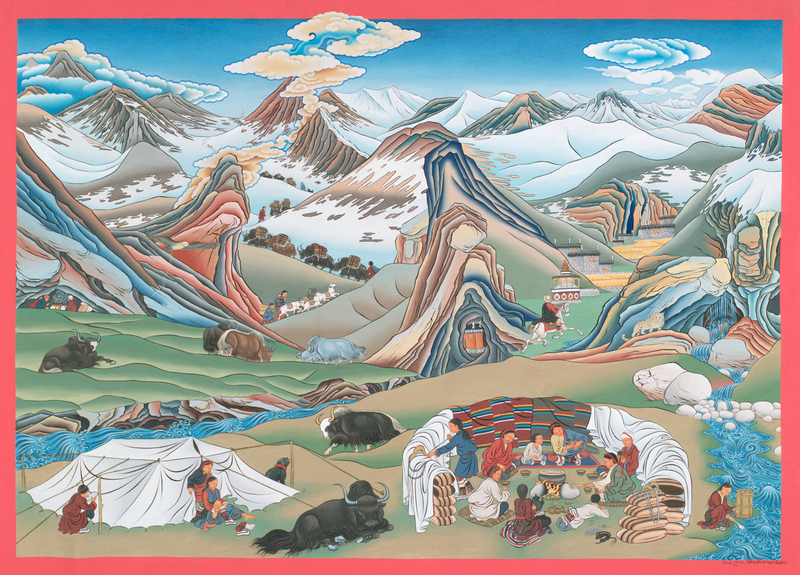 Norbu infuses the classical genre of Tibetan sacred art with vivid images of the pastoral life of his community. In this painting he depicts the annual trek to gather salt, an arduous journey into remote mountains that has been a critical aspect of Dolpo’s livelihood for many generations. Norbu’s works have appeared in National Geographic magazine, the Academy Award–nominated feature film Caravan, and a children’s book.